The role of IL-6 rs1800795 polymorphism in the development of hypertension has been inclusive. Therefore, the purpose of our study was to determine whether there is an association between IL-6 rs1800795 polymorphism and hypertension risk. PubMed, Embase and China National Knowledge Infrastructure (CNKI) were searched till Jun 2017. A total of 7 case-control studies with 1231 cases and 1122 controls were included. We did not found a significant association between IL-6 rs1800795 polymorphism and the susceptibility to hypertension (OR=0.94; 95% CI, 0.71-1.24; P=0.67). In the subgroup analysis of race, both Asian (OR=1.52; 95% CI, 0.15-15.48; P=0.73) and Caucasian (OR=1.01; 95% CI, 0.84-1.21; P=0.92) with IL-6 rs1800795 polymorphism did not show significant associations. In conclusion, this meta-analysis suggested that IL-6 rs1800795 polymorphism was not associated with the risk of hypertension. Hypertension is a leading risk factor for many disorders including coronary heart disease and stroke, and contributes to approximately 12.8% of annual deaths worldwide . In China, about 153 million (18%) Chinese adults were hypertensive in 2002 . It is estimated that 29.2% (range, 28.8%-29.7%) of the world population will have hypertension by 2025, increasing by about 60% . The causes of hypertension are complex and are correlated with numerous environmental and genetic factors. Many pro-inflammatory cytokines are known to be involved in the risk of hypertension. Interleukin-6 (IL-6) is mainly originated from mononuclear phagocytes and partly from fibroblasts, T and B lymphocytes, and vascular endothelial cells . IL-6 gene is located at 7p21 and encodes a cytokine that plays a role in inflammation and B cell maturation. In recent years, the role of IL-6 rs1800795 polymorphism in the development of hypertension has been kept exploring [5-11]. However, in most of those studies the sample size was small. Therefore, the purpose of our study was to determine whether there is an association between IL-6 rs1800795 polymorphism and hypertension risk. PubMed, Embase and China National Knowledge Infrastructure (CNKI) were searched till to Jun 2017. The search terms were “Interleukin-6”, “IL-6”, “polymorphism” and “hypertension”. In addition, the citations in the retrieved articles were reviewed to search for relevant studies. We also searched previous reviews and meta-analysis. The studies included must meet the following criteria: (1) The study assessed the association between IL-6 rs1800795 polymorphism and hypertension risk; (2) The study should be case-control or cohort study; (3) Odds Ratio (OR) with the 95% Confidence Interval (CI) was reported. The following information was extracted from all obtained publications: first author’s name, publication year, ethnicity, age, sample size and Hardy-Weinberg Equilibrium (HWE). The intensity of the relationship between IL-6 rs1800795 polymorphism and the susceptibility to hypertension was calculated with the OR and respective 95% CI. Heterogeneity between selected studies was inspected using chi-square-based Q test, with P value more or less than 0.05, representing the absence or presence of significant heterogeneity. The random-effects model was chosen to calculate the pooled OR. The subgroup analysis was carried out by race. In the sensitivity analysis, we excluded the study without HWE. The presence of publication bias was assessed by a visual inspection of a funnel plot. All statistical tests were used by the Reviewer Manager software. Characteristics of the included studies were shown in Figure 1. A total of 7 case-control studies with 1231 cases and 1122 controls were included. Two studies were conducted in Asians and five studies were performed in Caucasians. One study was not in HWE. Figure 1: Effect of IL-6 rs1800795 polymorphism on the risk of hypertension. As shown in Figure 1, we did not found a significant association between IL-6 rs1800795 polymorphism and the susceptibility to hypertension (OR=0.94; 95% CI, 0.71-1.24; P=0.67). In the subgroup analysis of race, both Asian (OR=1.52; 95% CI, 0.15-15.48; P=0.73) and Caucasian (OR=1.01; 95% CI, 0.84-1.21; P=0.92) with IL-6 rs1800795 polymorphism did not show significant associations. In the sensitivity analysis, the results were not altered when the study without HWE was excluded. Publication bias was not found in Figure 2. 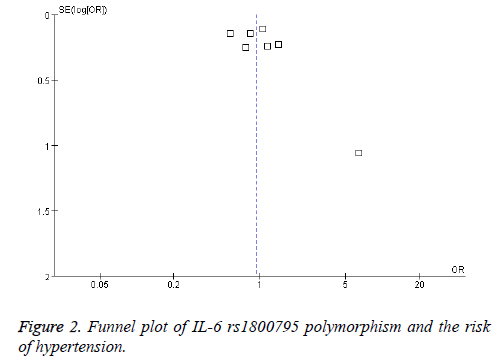 Figure 2: Funnel plot of IL-6 rs1800795 polymorphism and the risk of hypertension. In this study, a total of 7 case-control studies with 1231 cases and 1122 controls were included. We did not found a significant association between IL-6 rs1800795 polymorphism and the susceptibility to hypertension. In the subgroup analysis of race, both Asian and Caucasian with IL-6 rs1800795 polymorphism did not show significant associations. In the sensitivity analysis, the results were not altered. Kim et al. suggested that rs1800795 SNP of IL-6 gene was not related to arterial thromboembolic events . Lorente et al. suggested that IL-6 promoter polymorphism (-174 G/C) might be a favourable genotype in septic patients showing lower serum IL-6 levels and lower risk of death within 30 d . Ruiz-Padilla et al. found that IL-6 -174G/G genotype confers higher risk of failure in therapeutic response to LEF in Mexicans and if confirmed in other populations this can be used as promissory genetic marker to differentiate risk of therapeutic failure to LEF . Kumar et al. suggests that IL-6 gene polymorphisms are not associated with the risk of intracerebral haemorrhage . Hongmei et al. suggested that IL-6 -592G>C polymorphism was correlated with the risk of coronary artery disease . Some limitations were existed in this meta-analysis. First, many of the original studies did not adjust for potentially important confounders. Second, the inconsistency of the base line characteristics between the studies, such as age and gender, might increase the selection bias. Third, due to the lack of original information of the entire data, we did not evaluate interactions of gene and environmental factors in all pooled studies. In conclusion, this meta-analysis suggested that IL-6 rs1800795 polymorphism was not associated with the risk of hypertension. Lawes CM, Vander HS, Rodgers A. International society of hypertension. Global burden of blood-pressure-related disease, 2001. Lancet 2008; 371: 1513-1518. Wu Y, Huxley R, Li L. Prevalence, awareness, treatment, and control of hypertension in China: data from the China National Nutrition and Health Survey 2002. Circulation 2008; 118: 2679-2686. Kearney PM, Whelton M, Reynolds K. Global burden of hypertension: analysis of worldwide data. Lancet 2005; 365: 217-223. Talaat RM, Abdel-Aziz AM, El-Maadawy EA. CD38 and interleukin 6 gene polymorphism in Egyptians with diffuse large B-cell lymphoma (DLBCL). Immunol Investig 2015; 44: 265-278. Elsaid A, Abdel-Aziz AF, Elmougy R. Association of polymorphisms G (-174) C in IL-6 gene and G (-1082) A in IL-10 gene with traditional cardiovascular risk factors in patients with coronary artery disease. Indian J Biochem Biophys 2014; 51: 282-292. Li TZ, Qian XS, Guo RB. Relation between IL-6 and IL-10 polymorphism and OSAHS accompanying hypertension (Chinese). Acad J Chin PLA Med Sch 2014; 3: 276-279. Karaman E, Urhan Kucuk M, Bayramoglu A. Investigation of relationship between IL-6 gene variants and hypertension in Turkish population. Cytotechnol 2015; 67: 947-954. Panoulas VF, Douglas KM, Smith JP. Transforming growthfactor-beta1 869T/C, but not interleukin-6 -174G/C, polymorphism associates with hypertension in rheumatoid arthritis. Rheumatol 2009; 48: 113-118. Jeng JR, Wang JH, Liu WS. Association of interleukin-6 gene G-174C polymorphism and plasma plasminogen activator inhibitor-1 level in Chinese patients with and without hypertension. Am J Hypertens 2005; 18: 517-522. Pola R, Flex A, Gaetani E. The -174 G/C polymorphism of theinterleukin-6 gene promoter and essential hypertension in an elderly Italian population. J Human Hypertens 2002; 16: 637-640. Babel N, Cherepnev G, Kowalenko A. Non-immunologic complications and gene polymorphisms of immune regulatory cytokines in long-term renal transplants. Kidney Int 2004; 66: 428-432. Kim SK, Chung JH, Kwon OY. Promoter polymorphism (-174, G/C) of Interleukin-6 and arterial thromboembolic events: A meta-analysis. Med Sci Monit 2016; 22: 4345-4353. Lorente L, Martín MM, Pérez-Cejas A, Barrios Y, Solé-Violán J, Ferreres J, Labarta L, Díaz C, Jiménez A. Association between Interleukin-6 promoter polymorphism (-174 G/C), serum interleukin-6 levels and mortality in severe septic patients. Int J Mol Sci 2016; 17. Ruiz-Padilla AJ, Gamez-Nava JI, Saldaña-Cruz AM, Murillo-Vazquez JD, Vazquez-Villegas ML, Zavaleta-Muñiz SA, Martín-Márquez BT, Ponce-Guarneros JM, Rodriguez Jimenez NA, Flores-Chavez A, Sandoval-Garcia F, Vasquez-Jimenez JC, Cardona-Muñoz EG, Totsuka-Sutto SE, Gonzalez-Lopez L. The -174G/C Interleukin-6 gene promoter polymorphism as a genetic marker of differences in therapeutic response to methotrexate and leflunomide in rheumatoid arthritis. Biomed Res Int 2016; 2016: 4193538. Kumar P, Misra S, Kumar Yadav A, Kumar A, Sriwastva M, Prasad K. Relationship between Interleukin-6 (-174G/C and -572C/G) promoter gene polymorphisms and risk of intracerebral haemorrhage: A meta-analysis. Pulse 2016; 4: 61-68. Hongmei Y, Yongping J, Jiyuan L. Interleukin-6 polymorphisms and risk of coronary artery diseases in a Chinese population: A case-control study. Pak J Med Sci 2016; 32: 880-885.